Ever since this powerful bull run started (thanks to Captain Ben), except for the last two days, SPX never closed below its 13 EMA (daily). It has tagged it 7 times since 9/1 and bounced off it quickly. There have been some minor selling every time SPX closed above its 13 EMA+2.5% V. Shift. 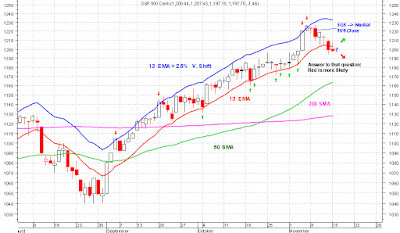 The sharpest sell off happened in three consecutive days after 9/20 when SPX close above its 13 EMA+2.5% V. Shift for the second time since the start of the rally. On 11/4 and 11/5, SPX closed again above its 13 EMA+2.5% V. Shift. Right on cue, selling started the next day. Except for one up day (11/10), selling has continued into the close of today. 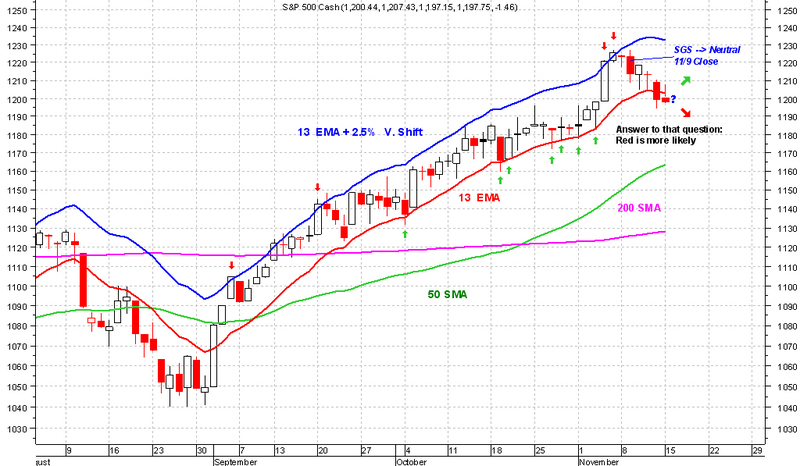 SPX has now two consecutive days of closing below its 13 EMA. That is not good for bulls. As of now, the likelihood of more selling is higher, but not high enough for me to give up on this rally and open short positions. Tomorrow will be interesting. If bulls are to continue their march upward, they'd better get SPX to close nicely above 1200, something like 1211. If bears want to take over, they'd better push it down to at least 1191. If nobody wins the fight tomorrow, then we have to wait for another fight on Wednesday. Another reason that I'm not giving up on this bull run is that I haven't seen Big Money getting ready for a major sell off. Big Money positions itself well by selling in advance of a major sell off. I haven't seen that yet, maybe we see it tomorrow. I'm in cash (moved to cash on 11/10). I do have small long positions in a few stocks that I opened today for my short term position trading.